Hardback Japanese stabbinding housed in a clam shell box. 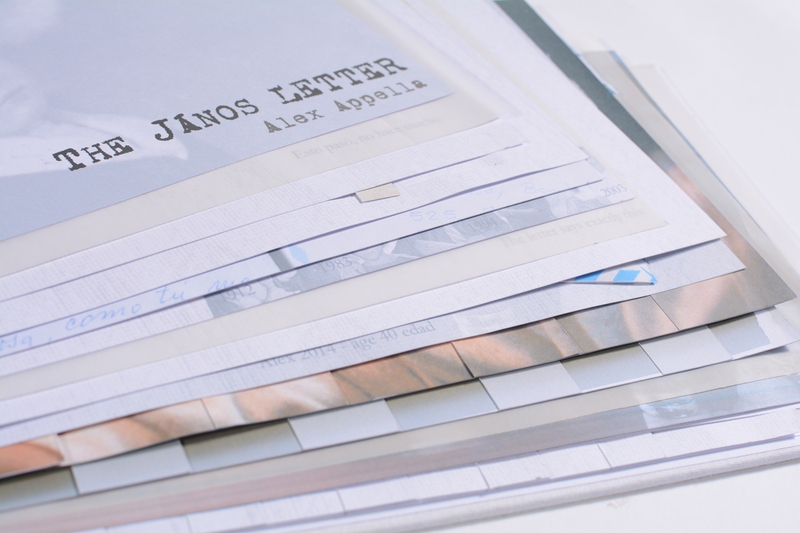 The János Letter tells the true story of the arrival of an extraordinary letter through 11 digitally produced collages and hand woven pages. The large format pages encompass the reader in a journey across time, continents, and realms. Text intertwined with digitally produced collages enhance the reader’s interpretation. (Spanish/English). Both languages are of equal importance throughout the entire book. its eventual arrival to author’s doorstep, 30 years later. about János and our family’s journey. I felt certain of that until May of 2014, when I received a letter in the mail. letter appeared for the first time on my doorstep last May. János passed away in 2003. The letter János wrote to me is a prologue. The letter is an epilogue. The letter is a turning point within a work I believed to be complete. The letter, and its arrival, is too unbelievable to not share, so that readers may decide for themselves. seamlessly with its counterpart, The János Book. inconceivable into a certainty one can either depend on, or question endlessly. As needed.